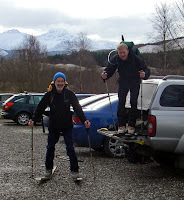 In the carpark Bill & Andy showed off their new winter gear, a right couple of plankers. 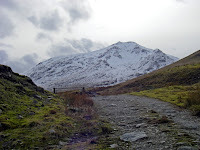 The track from Dalrigh follows Glen Cononish to the foot of Ben Lui, and you have time to appreciate the shape of the mountain, particularly Coire Gaothaich. 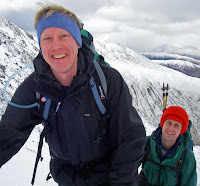 We could see lots of people in the coire all heading for Central Gully. It was busy, and they must have had a very early start. We counted 19 individuals ahead of us, hope their steps are still intact! Entering the gully proper a vicious snow squall hit straight out of the north, visability dropped to our surroundings, and we wondered how tough it would be when we topped out. There had been an accumulation of new snow that was soft, and didn't support steps, two ice tools made life a lot easier. 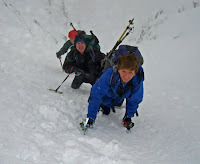 The headwall was steep but fortunately the cornice was tiny and the wind not too strong as we reached the top, a hot drink and sandwiches were very welcome. Well today was a day of poor visibility! 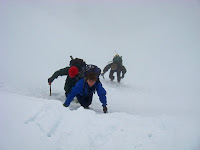 Descending Ben Lui's northern ridge was tricky. 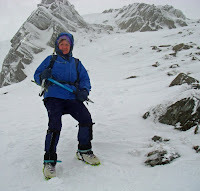 The wind was fierce and the chill factor very high, we didn't hang about. 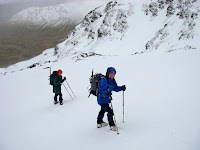 A final romp down soft snow brought us back to the coire floor, it was almost warm. Would you believe it, the storm passed. Looking back we reflected on our tussle down the ridge. 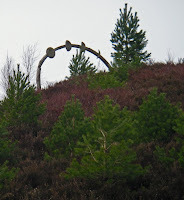 On the walk out a strange object appeared on the hillside, it took a while to register that it was a wayside 'point of interest' for the West Highland Way which cuts the Cononish track at Dalrigh. 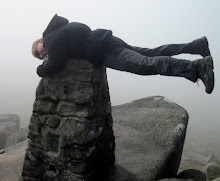 Julie was not pleased to have missed a day on one of Scotland's classic gullies. Never mind, there's always next time. Looks like you had a challenging day! Nice blog. Thanks anonymous, it was verrry cold coming off the ridge.